Just 4 short days until former Governor Jesse Ventura will speak on and about the events of 9/11. The news here in Arizona is already gearing up to cover (or cover up) the former Navy seals appearance. The Mesa convention center where Jesse Ventura will give his talk and lecture will be abel to hold upwards of 1700 people, attendance is expected to be over 800 as of now. Activist all over the state are hard at work promoting this event in any and every way we can think of. Thanks to there hard work this event will be a success but any last minute help anyone can provide will be greatly appreciated! Lets make this an event never to forget! Best selling author and former Governor of Minnesota Jesse Ventura will be speaking on Thursday, September 11th at the Mesa Convention Center 7pm. The address there is 263 N. Center St. Mesa, AZ. Main Hall / Bldg. C. This event will be MC'd by Charles Goyette. Suggested donation of $10. Jesse will be at Changing Hands Bookstore for a book signing on Wednesday Sept. 10th @ 7pm. Located at 6428 S. McClintock / SW corner of McClintock & Guadalupe. Friday Sept. 12th he will be at Barnes & Noble for another book signing. The address for that is 21001 N. Tatum Blvd. / NE corner of Tatum and Loop 101. 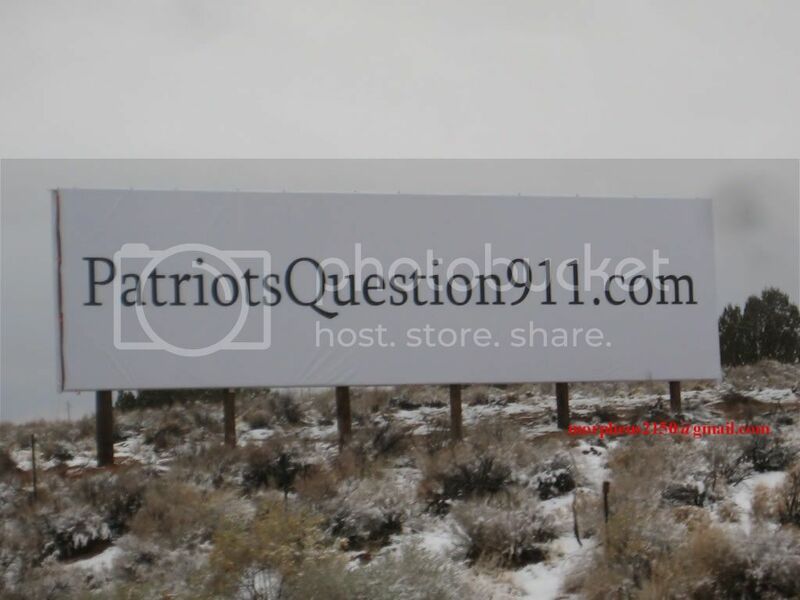 The Tucson 911Truth Group is planing on renting a van or bus to help us all get up to Mesa. More details coming soon. Please RSVP on @ MeetUp, MySpace or FaceBook If you can join us for a historic evening of Truth! Today is Day 13 of Blair's fast. It was 101 degrees in Phoenix today, and I can assure everyone that it was hot!! Blair is doing very well. He has lost 17 pounds total but still insists he's fine. As he says, he's not running any races, but he's still walking and conversing with all who come to see him. We had a lively discussion on theology for about an hour while I was there. Blair is as sharp as a tack and eager to debate! Today a couple who live in San Diego drove to Phoenix on their way to the Grand Canyon and stopped to say hi to Blair. We all thought that was pretty nice of them. 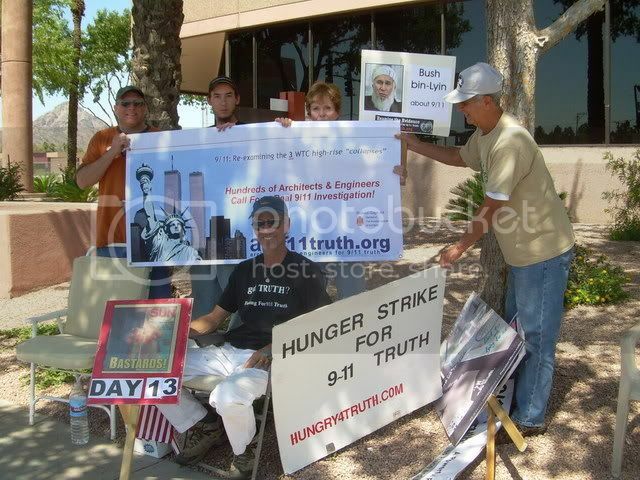 Members of the local 9/11 Truth group came and went all day long. It's gratifying to see all the support that Blair is getting. Please continue to keep Blair in your thoghts. He is very appreciative of everyone and expresses his thanks for all of your supportive email messages and good wishes. 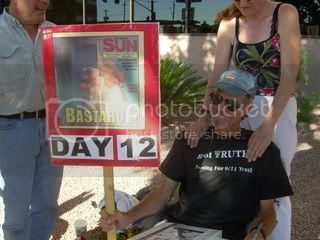 Blair Gadsby went to the doctor on this day of his hunger strike for 911 Truth. 11 days with out food and the doctor gave him a clean bill of health! Blair is committed to seeing this thing through and will not compromise his request of two hours of McCains time. Good weather permitting a plane is scheduled to toe a 35 foot banner on friday between 5pm and 7pm, a rally of the movement here in Phoenix has been set for that time in front of McCain's office. 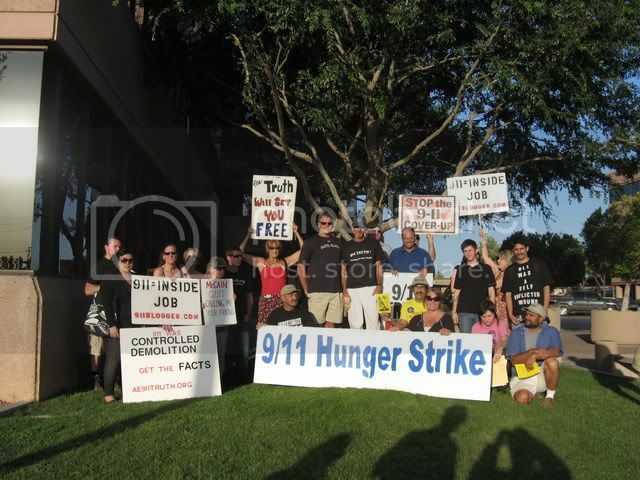 The banner will read "Google Hunger Strike for 911 Truth" the plane will be over McCains office around 5pm for 15 to 20 minutes and then fly all over the valley. With the plane in the air now would be a good time to call local Radio and TV stations! Are you as hungry as we are? Author and former Federal prisoner for peace, Mike Palecek spoke to an appreciative audience of about 70 last night in the Tucson stop of his Cost of Freedom Tour. Mike is promoting his two latest book projects: as co-editor of [Cost of Freedom - The Anthology of Peace and Activism] and as author of [Iowa Terror] - a novel based on the official lies of 9/11. Mike was joined on stage for readings by a distinguished group of poets, writers and photo-artists who made contributions to the Cost of Freedom project including Lilvia Soto, Nora Nickerson, David Ray, Michael Gregory Joe Rebholz and Michael Rattee. Palecek's next stop is Las Vegas, NV - see www.mikepalecek.com for tour details. The tentative Cost of Freedom tour schedule appears at: http://www.911blogger.com/node/14410. the noon and evening events.